Warren Buffett is widely regarded as the most successful investor in the world at 85 years of age, Chairman and CEO of Berkshire Hathaway with a personal net worth of $US66.9 billion (April 2016). 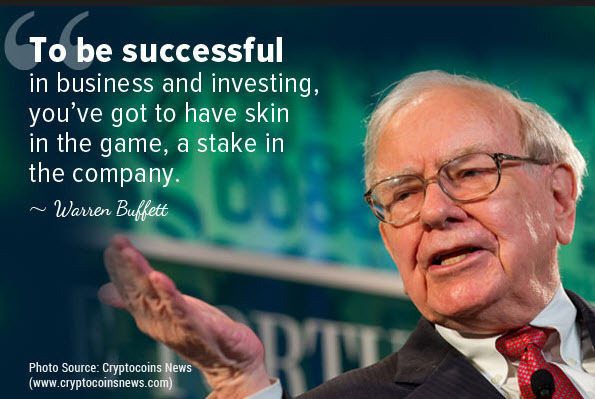 He is most often referenced when the phrase “skin in the game” is mentioned due to his long standing views that board directors and senior executives need to have a stake in the company to be in alignment with shareholders best interests. There have been plenty of studies that demonstrate having board directors with an equity stake perform better and experience better corporate governance. We currently have a worrying trend in ASX200 companies where there is a growing percentage of board directors who do not own shares in the company. Nearly 38% of board directors in ASX environments do not own more than a year’s board fees worth of shares and 11% own no shares at all. It begs the question, if the board of directors don’t want to invest in the company that they serve, why should I invest? There always seems to be a very small but noisy chorus of “aspiring” board directors who come into my office telling me that they won’t invest their own money in the company of the board that they wish to join. Even when it is very clear that all the other board directors have invested the equivalent of the first year’s board fees in the company, the list of excuses are endless. I want to be an independent board director, I don’t buy board seats, I don’t have the money, my partner won’t let me, I am special, I don’t need to play the game like everyone else, I don’t like risk. When I hear these kinds of statements I actually hear the unspoken words – I don’t believe in the company. The need for independent board directors is a pretty common argument and there may be a case for one or two independent board directors in the mix, although the jury is still out regarding how beneficial having a proportion of your board directors with absolutely no skin in the game really is. In fact, there are a number of studies and reports that point to independent directors destroying shareholder value. Investor independence is not actually required in my opinion, to achieve good governance structures and independence of the management in the company. Smart investors want to see an alignment between the board, the executives and shareholder interests. When capital raising for early-stage businesses, in the private equity and venture capital world, it is rarely acceptable that board directors do not take an equity stake in the business either in the form of sweat equity or modest investment. It is very difficult to secure a seat at the table by trotting out your favorite excuse of a desire to be an independent director and to not put your own money behind the company. We are quite often talking about token gesture investment levels given one year of board fees is usually a very small amount of money, but this alignment is critical to a successful capital raising or IPO. Skin in the game gives investors confidence that the board members genuinely believe in the company and are not just turning up for the board fees. If you are an aspiring board director it is important that you understand this paradigm. If you don’t want to play in this world, you might need to seriously reconsider if being a board director is really where you want to be heading or you may need to rethink the types of board roles you want to pursue. Aspiring female directors please note that you are not exempt if you want to secure ASX, Private Equity, Venture Capital-backed or pre-IPO directorships. Aspiring directors who don’t want to align with shareholder interests find getting their board career established very challenging. If you are a more established and experienced board director, you may have a greater capacity to demonstrate a value proposition that exceeds an investment in the company, although I believe in the future there will be many more ASX-listed companies putting minimum securities holding requirements in place, especially with board director performance under increasing scrutiny. Warren Buffett the ‘Oracle of Omaha’ would probably agree. Director Institute www.directorinstitute.com.au offers members the opportunity to network with peers through monthly executive networking meetings, round tables, and group facilitated sessions to share ideas. We also host well-known guest speakers to address a variety of stimulating topics ranging from practical to inspirational to motivate and inspire your board career. Most importantly, Director Institute has the largest board related ‘jobs board’ in the Australian market.